A plug in Power over Ethernet (PoE) adaptor to power communications with the Plus Radio Ethernet receiver, and Plus LAN data loggers. 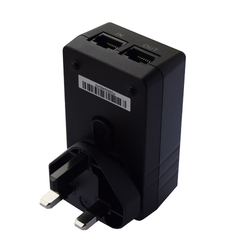 This power supply comes with UK, EU, US and AUS adaptors. Ethernet cables are not supplied. These are supplied with all Ethernet receivers and Plus LAN data loggers, you only need to order this product if you require a spare or a replacement.